Colonising another world is a tremendous undertaking. It involves sending a preposterous amount of materials and spending a gigantic number of years and money to get a few human beings to another alien rock – a rock many – if not all of them – will never return from. We often forget the sheer cost of such an endeavour, but anyone who’s moved countries can tell you that regardless of mental fortitude, uplifting your life is hella hard. Uplifting to another planet entirely must be soul shattering. 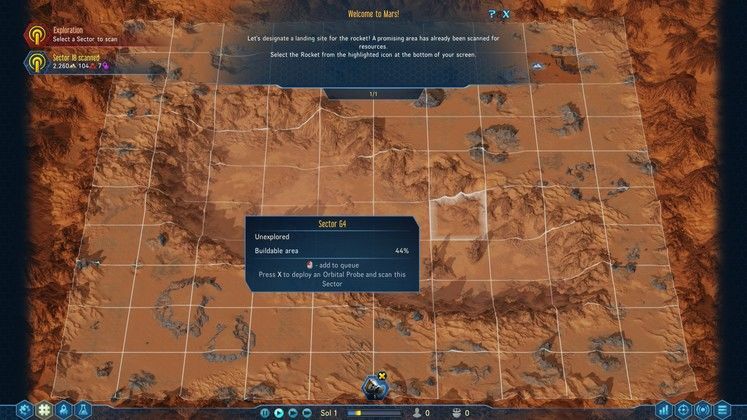 Unlike other colonisation games, Surviving Mars makes that human cost exceedingly clear. From the moment you land your first rocket in the Red Planet to way after the first Martian baby is born, it’s an uphill struggle. 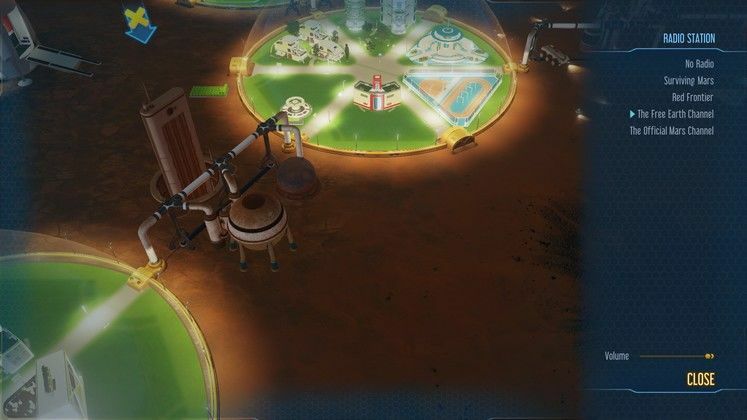 Constructions wear and tear, colonists age and die, and everything requires maintenance – Surviving Mars really earns the “Surviving” part of its title. 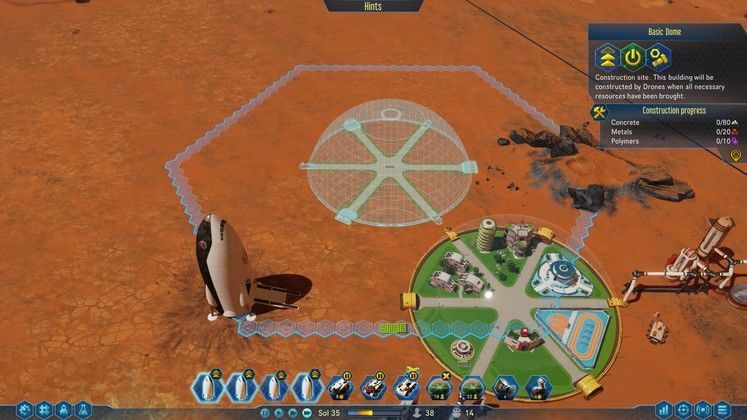 Using drones and rovers to move around the fourth planet’s landscape, your immediate objective is to prepare the infrastructure for the colonists eventual arrival. 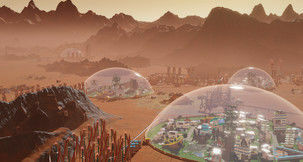 You place extractors, moisture vaporators, and <a href=”https://mars.nasa.gov/mars2020/mission/instruments/moxie/”>MOXIE oxygen generators</a> to get your colony going, and once ready to receive the first humans, you graduate to huge glass domes. 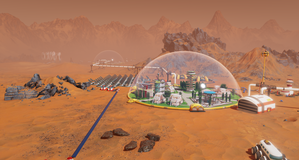 Space is at a premium in Mars, and the glass domes do not have a lot of space. 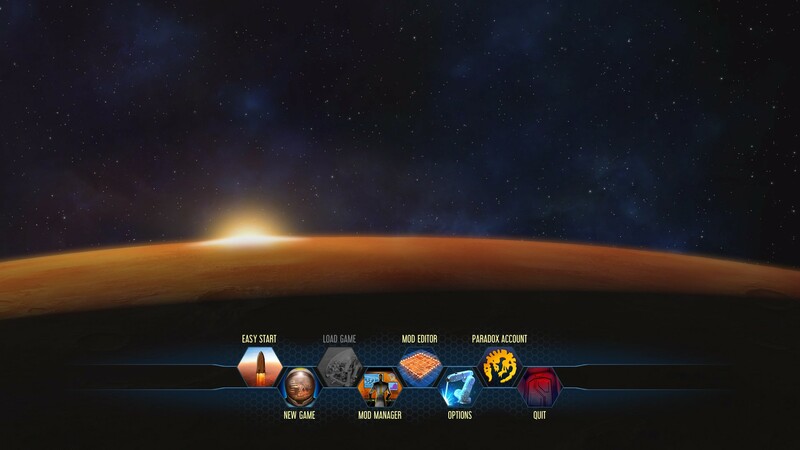 The game works on an invisible hexagon placement grid, requiring you to carefully pick and place your residences and service buildings inside the domes. 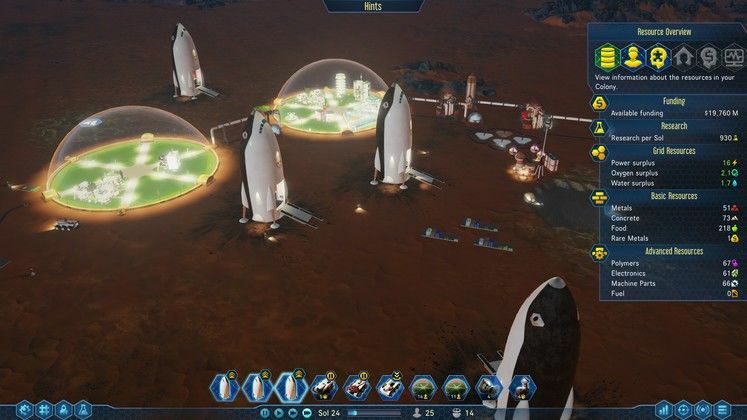 Annoyingly, colonists are unaware of the concept of commute and won’t work on a different dome than the one they live in, preventing you from creating residence-only domes or research areas and instead having to settle for a focused distribution at best. As a proper foothold of human civilization, colonies need botanists, engineers, medics, and more, manning everything from diners and grocers to factories and hospitals. All the while, you must have scientists working on research labs both to speed up technology discovery and justify funding for the Mars mission. Funding is necessary to call in rockets from Earth or outsource , speeding up research. 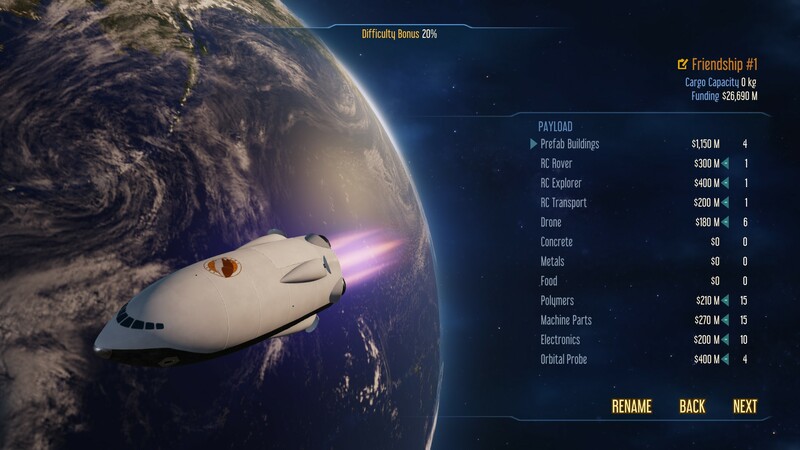 Rockets, meanwhile, allow you to either bring tons of materials and prefab buildings on a cargo transport or a dozen colonists in a passenger one, providing a vital source of new blood and resources in the early years of your colony. What I most like about this feature is how it forces you to rely on it in a natural way, efficiently creating the feeling that there’s a mother planet somewhere out there hoping you succeed in your mission. Calling in for needed resources always feels like someone is lending a helpful hand in an hour of need. Furthermore, the review process on which you select colonists out of an immense list of applicants further cements the feeling of overseeing a massively important initiative, and the varying ages, traits, perks, and flaws to be considered would make the most experienced hiring manager feel right at home. 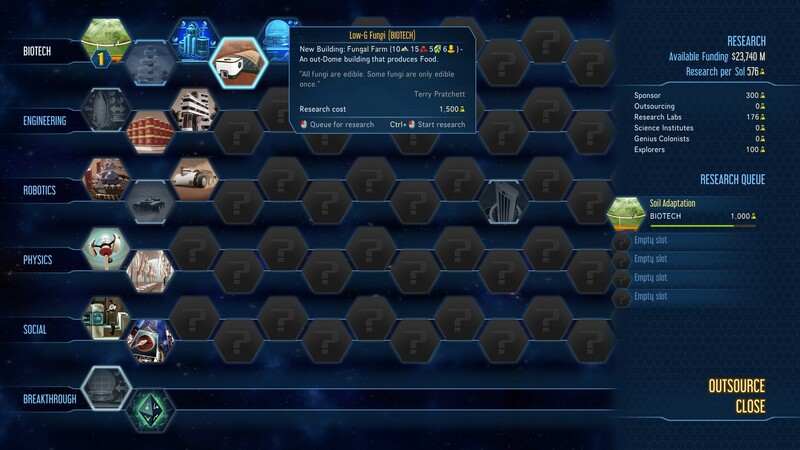 As you progress through the game, you will find anomalies in Mars that lead to deposits, research boosts, and “mysteries” – end-game storylines that lead to a special and unique outcome. 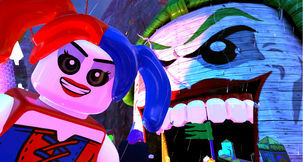 There are several of those in the game, and they take a while to come to fruition, but are quite interesting to pursue. 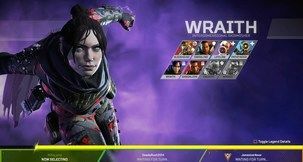 The game is not all wonders, though, as some pretty glaring aspects of it are not only less than ideal, but downright infuriating. Drone management makes building things far away exceedingly complicated, as you must move a RC rover into position to build a storage, then use a transport rover to move goods before starting the build. The logistics would be par for the course if some of the controls weren’t so obtuse, including an unexplainable lack of Shift-click functionality to queue multiple orders. Similarly, the game lacks a continuous mid-level camera zoom, instead offering jarring transitions between a close angle or a huge planet-wide satellite view, making it extremely annoying to get a proper grasp of the terrain and the features around you. Nothing beats colonist management, however, and it’s absolute awfulness. It’s unintuitive and cumbersome, lacking any sort of list or centralised display to sort colonists by parameters. Instead, you must look for them inside the game world and click each of them, one by one, to see what they’re up to. It’s all made worse by the fact their unhappiness dictates everything from colony survival to chance of babies being born, essentially ruining your experience through no fault of your own. Besides being impossible to efficiently cycle through your colonists, it is all made worse by the AI’s insistence on not allocating people to their chosen profession. More often than not, I had to hand place medics in infirmaries only to see them assigned randomly to a factory a few moments later. 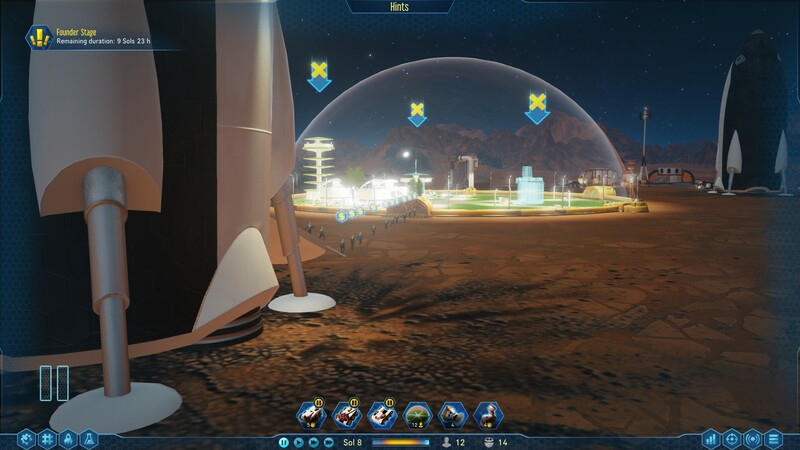 Even setting domes to not take in certain types of colonists proves useless, as the game just dumps all of them straight out of a rocket into the nearest one. However, all of those bad points are almost completely redeemed by music. Surviving Mars has one of the best radio soundtracks I’ve heard in recent years, rivalling GTA V and featuring half a dozen radio stations that range from techno and country music to pop and rock. As far as I could tell, all songs are original, which is surprising given how astoundly good and catchy they are. 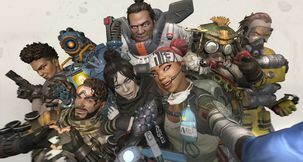 The one problem is that there aren’t a lot of them, and the game shamefully restricts that diversity even further by withholding an extra radio station behind a paywall in the Deluxe Edition. At the time of this review, we didn’t had access to that radio station, so I’m unable to comment on its quality compared to the game’s vanilla offerings. Technically, the game is quite reliable and pretty. Graphics are capable, structure and drone animations are lovely, and I’ve experienced no bugs worthy of mention. 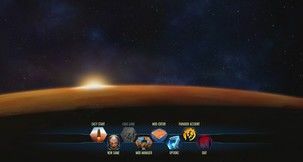 The UI, however, is exceptionally pretty, with menus often showing an artistic composition of planets, sunsets, and spaceships that lend a charming feel to proceedings. Throughout my two weeks with the game, I had a love and hate relationship with Surviving Mars, as it’s a very good yet slightly enraging experience. 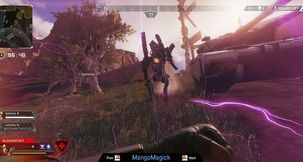 I was extremely impressed by the game’s level of quality, from its unique ideas and execution to the surprisingly good soundtrack that elevated the game above the fold, but other aspects of it are below Early Access standards. 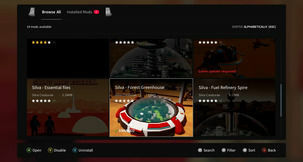 The horrible colonist management issues and absurd absence of quality of life made me question Heamonint’s QA and design teams, and it is frankly preposterous that such an ineffective solution to an essential gameplay system made it through to launch. 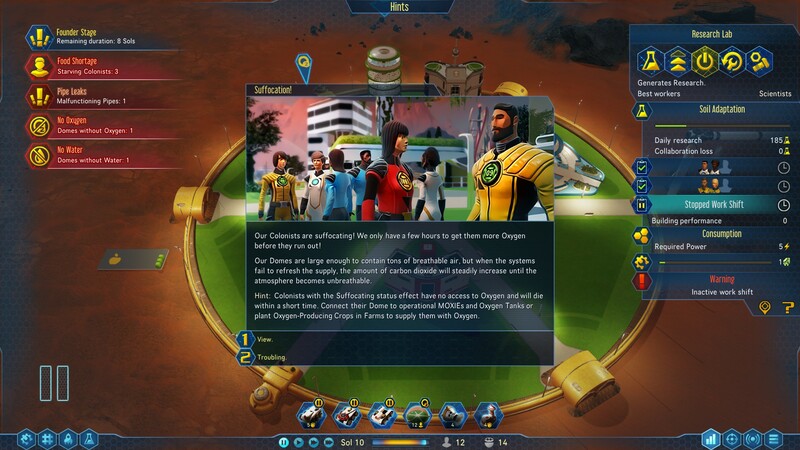 The end result, however, is a very good game whose flaws can be fixed, and I look forward to playing more of Surviving Mars when they are. A very good, yet slightly enraging experience. Reaching colony self sufficiency for the first time after hours of struggle.